Order Now for Pre-Order Pricing. Click Here to Order Now! We expect to have our first shipment in early to mid march and your credit card will not be charged until we ship. Special pricing will end when our first shipment arrives! From the creator of the very successful Aerobe/Wala kites comes a beautiful new kite. 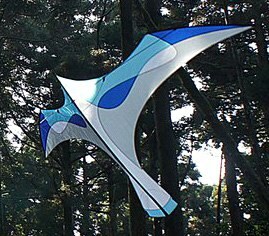 The Laima Gliding Kite glides gracefully in low or light wind conditions. While the innovative WCS (weight control system), makes it easy to glide and perform agile aerobatic maneuvers in low winds, the Laima flies stably in winds less than 8 mph.